Running your air conditioner is costly – both to your wallet, and the environment. 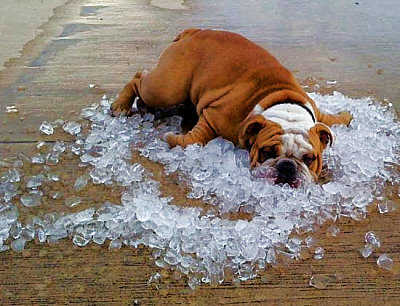 But how do you stay cool when Mother Nature turns up the heat? We have four easy do-it-yourself ways for you to keep cool this summer. If you don’t want to turn on your air conditioner – or if you don’t have one at all – you can use a fan to help you cool down. If the air inside your home is already hot, a fan on it’s own won’t do much except blow hot air around. Fill a shallow bowl with ice and place it in front of the fan. As the ice evaporates, it will cool the air as the fan blows it. It’s DIY air-conditioning! At night, the temperature outdoors is often cooler than indoors. That’s the air you want in your house. So open your windows at night to let the cool air in, then close the windows in the morning to trap that air inside your house during the day. Take this one step further by putting box fans in front of windows on opposite sides of the room to create a cool breeze. If it’s hotter inside your home than outside, you’ve probably already opened a window to try to get some of that cool air in. If it’s not working as well as you’d hoped, spray a sheet with cold water and hang it in front of the open window. As the breeze passes through the damp sheet, it will cool the air coming into your home, giving you some extra relief from the heat. A lot of the heat in your home is actually generated in the home. Create less heat, and it will be cooler inside. Air drying your clothes instead of using the machine, skipping the drying cycle on your dishwasher and turning off your computer when you’re not using it are all easy ways to turn down the temperature in your home. It can get pretty hot out there, but you can use these tips to keep you cool inside all summer long. Want to keep you cool in the summer and cozy in the winter, all while reducing your energy bills? Contact your local Building Energy Pros affiliate or call Building Energy Pros at 1-800-309-6006 for more information.